What’s in a name? Juliet asked. Bell peppers, capsicum, sweet peppers, paprika, peperone, chiles—what you call this bright, lumpy family depends on where in the world you reside. From Colombia to China, Australia to Spain, they’re one of the most common vegetables in the world and a staple in many cuisines. Yet, regardless of their myriad names and places of origin, one thing we can agree on is the surprising matter that, just like tomatoes and avocados, the bell pepper is secretly a fruit. For culinary purposes, though, it’s classed as a vegetable in kitchens the world over. Few types of fresh produce can compete with the versatility of bell peppers. They are like little shapeshifters: When raw, they are bright, crunchy and refreshing; when roasted, they develop a low-key sweetness. One of our favorite things about them is the variety of colors, shapes, and sizes: green, yellow, orange, red, white, purple, or speckled, and some round, pointed, or thin! While we’re on the topic of appearance, did you know that bell peppers are all green at the beginning of their lives? Green bell peppers are simply unripe peppers—hence the bitterness in comparison with the red ones, for example, which are completely ripe. As a result, green bell peppers will last much longer than the other colors, both at the store and in your kitchen. The bell pepper and its cousins are good for us too, as they contain lots of antioxidants that fight inflammation and improve our immune function. They are a great source of vitamin A, vitamin C, and potassium, and dose our bodies up with fiber, folate, and iron, which is especially true of red peppers. Bell peppers love hot climates, which is why they were first found thriving in Mexico, Central America, and South Asia. Nowadays, due to their abundance (and the fact that they are grown in greenhouses), bell peppers can be purchased year-round. When veggie shopping, look for peppers that are firm to the touch: They should be crisp and shiny. The number of lobes or bumps on the top surrounding the stem of the bell pepper varies, and that can actually help you decipher the best use for it. Generally speaking, those with 4 or more lobes are larger, and best eaten raw. They also contain more seeds, which can be planted in your veggie garden. Bell peppers with three lobes contain fewer (or no) seeds, and are best roasted, sautéed, or grilled. But feel free to experiment. Although they brighten up the kitchen on display in a fruit bowl, bell peppers will stay vibrant for much longer if stored in the vegetable crisper. You’ll know when they begin to decline in health because, just like us, their skin shrivels from old age. Bell peppers will last 1 to 2 weeks in the fridge, but once chopped up, just 2 to 3 days. If you want to freeze them, a good option is to blanch them for 4 minutes, then drain, add to a container, and freeze. Blanched bell peppers can last up to a year or more when frozen, while unblanched ones should be used within 6 months. Make sure to deseed before freezing, as it is easier to get all the seeds out while the fruit is still fresh. If you want to try drying your bell peppers, wash, core, and seed them and cut them into 3-cm/1.5-inch strips. Steam for about 10 min., spread on baking sheet, and dry in the oven at the lowest temperature until crisp, occasionally stirring and moving the tray. When cool, place the dried peppers in bags or containers. They last much longer when dry and can be used as a replacement for fresh bell pepper in almost any recipe. 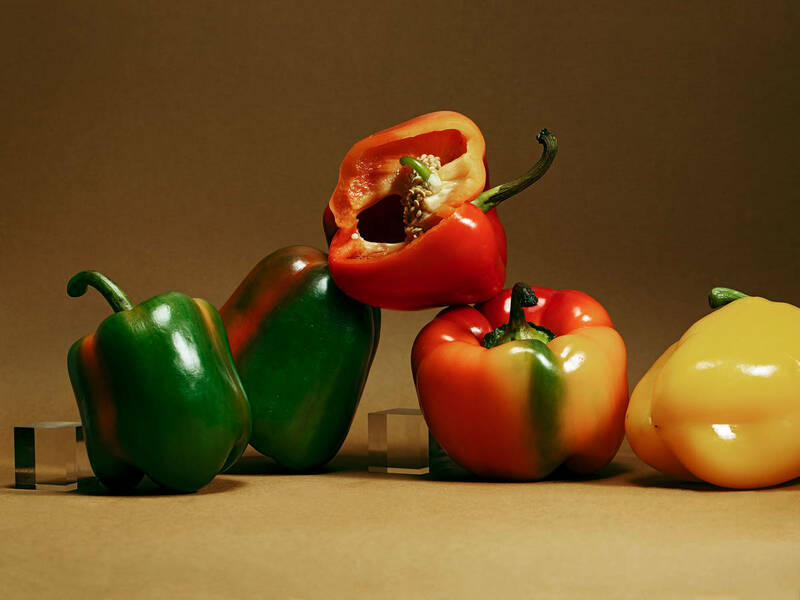 The unique bell pepper taste depends on its color: Green and purple ones are more bitter, whereas red, orange, and yellow ones are sweeter and almost fruity. Slice your bell pepper into strips and use it to generously scoop up your favorite dip, or cut into squares, coat in marinade, skewer, and chargrill yakitori style. Stuff a whole bell pepper and cook it in the oven, or add to stir fries, curries, or fajitas.